Location: Ica, Off the Pacific coast, Peru. 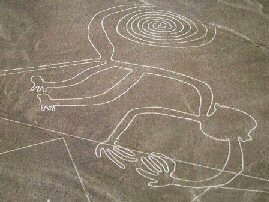 Grid Reference: 14° 49' 60" S, 74° 57' 0" W.
The Nazca desert drawings are probably the largest and best known of their kind in the world. Their original function is still only guessed at. 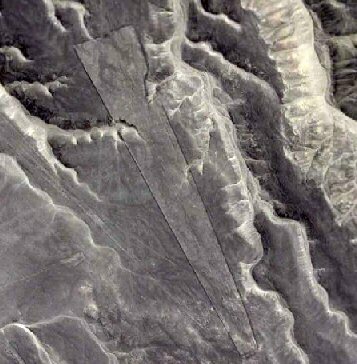 The Nazca valley is a strip of level desert ground 37 miles long and a mile wide. The enormous drawings were made by removing the dark purple granite pebbles which cover the floor, and exposing the light yellow sand beneath. The drawings were first confirmed when commercial airlines began flights over the Andes. They are clear enough to be viewed by astronauts aboard Skylab, orbiting 270 miles above Earth. There are essentially two kinds of drawings at Nazca; Those that are Zoomorphic in nature (above), and the larger geometric ones, some of which run into the surrounding hills. The purpose of these designs is still unknown, although astronomy and a form of ritual worship is suspected. 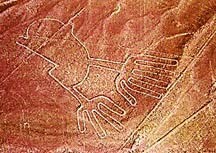 The Nazca drawings are largely believed to have been created by the Nazca culture between 200 BC and 700 AD. The first detailed study of the drawings was initiated by the German astronomer and archaeologist Dr. Maria Reiche. She discovered that the lines, some of which run for up to five miles, have an average error of no more than 9 minutes of arc, a deviation of only 4.5 yards per mile. The same figure that is the limit of accuracy which can be obtained by modern photogram-metric survey techniques. One drawing represents a thin-limbed monkey, recently identified as the Spider Monkey from the Amazon jungle, while a remnant of Nazca pottery has a distinct picture of a Penguin indigenous to either Antarctica or possibly the Galapagos islands. Another piece of pottery found has the faces of five girls on it – one white, one red, one black, one brown and one yellow (9). Article: The Lost City of Nazca. 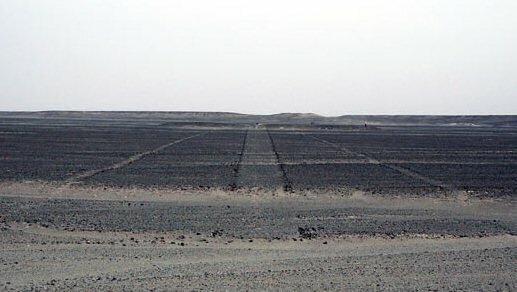 In 1983 Italian archaeologist Giuseppe Orefici began a long-term project to investigate the Nasca. Every year he brings a team of specialists to South America for 3 intensive months of excavation. Orefici has concentrated on one remarkable Nasca site, an ancient city called Cahuachi. He is convinced that this mysterious place is the key to understanding the line builders. The Cahuachi site is huge, extending across 370 acres. The most impressive monument is this 30 metre high pyramid which dominated the ancient city. It was built by modifying a natural high point in the land. As well as the pyramid, there were 40 other structures, each sculpted from the landscape itself and enhanced by massive mud brick adobe walls. Extensive plazas and terraces once covered the land here, nearly 2,000 years ago. Cahuachi lies 75 kilometres inland from the coast of Peru. 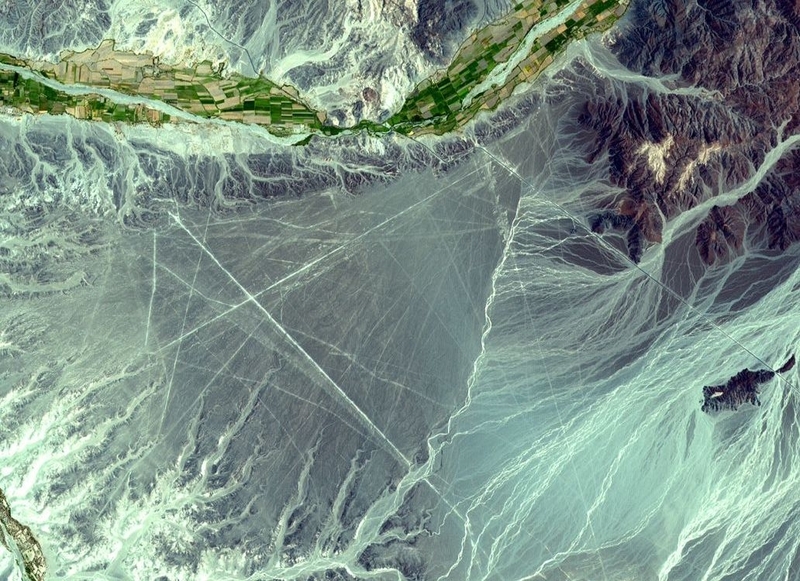 The archaeologists eventually unearthed 63 pieces of Nasca fabric, but there is a puzzle. The fabrics come from different periods of Nasca history and yet they were all jumbled up together. Many parts are badly decomposed due to the presence of organic matter and due to exposure to humidity. These pieces of cloth were laid in a tomb in Cahuachi. They have a special significance not only as example of textile art but because the cloth has been sacrificed. It was placed with its needles and needle cases in this large tomb. The sacrifice of the fabrics provided important evidence about the kind of place Cahuachi was in ancient times. The textiles are richly decorated with images from Nasca mythology and don't appear to be intended for everyday use. It looks as if the people of Cahuachi were rather special, a Nasca elite. If the average Nasca citizen wasn't wearing these fabrics, who was? All the evidence from Orefici's huge collection of textiles points to one conclusion: the people of Cahuachi weren't soldiers or citizens, they were priests. 2,000 years ago it would seem like an oasis. We have the river valley with fields, we have very strong, healthy people, plenty of food to eat, no warfare. They were fairly short, long black hair, probably muscular from working very hard and we have evidence from the skeletal materials, particularly the teeth, that they were very healthy people and also from those same skeletons we see no evidence of trauma. There was no warfare here. One skeleton was found with a powerful blow to the frontal area of the head, a sharp blow which completely smashed the nasal septum. It completely smashed the bones of the face. It had fossilised excrement in the mouth. This isn't the first time that excrement has been found in the mouth of a mummy, it is a very unusual discovery. Recent investigation has linked the lines directly with water. Although the animal images are the best known, there are also the 800 straight lines which run for many kilometres across the pampa. It's been shown that all but one of these lines start from star-like radial points often marked by a low mound and every one of those points bordered rivers and tributaries so if the lines were used for ceremonial walking, as seems very likely, some Nasca ceremonies were devoted to the precious sources of water.Water is also intimately connected with Cahuachi. 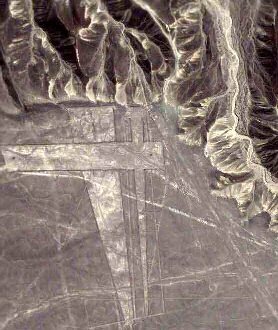 For much of its length the Nazca river runs underground. Where it re-emerges the Nasca built their ceremonial capital. After 17 years of excavation Giuseppe Orefici has been able to use the hard archaeological evidence to reconstruct the world of Cahuachi. Moulded from the desert itself the pyramids and plazas of the lost Nazca city were the site of ceremony and ritual. It was a city of priests who were guardians of Nasca culture and religion. What happened at Cahuachi? Between 300 and 350 A.D. there were two natural disasters. A great, very powerful flood - we have found the evidence in all the excavations - and an earthquake, an earthquake which split the temples in two. 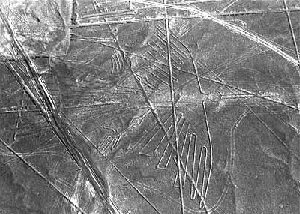 The discovery marks the first time since the 1980s that a picture other than a geometrical pattern has been found on the Nazca Plateau. The picture was found by a team of researchers including Masato Sakai, an associate professor at Yamagata University, after they analyzed images from a U.S. commercial satellite. The research team will use images from the advanced land-observing satellite "Daichi," which was launched by the Japan Aerospace Exploration Agency in January this year, to create a distribution map of images on the earth that can be seen from the air. There is evidence that vehicles had driven in the area, and part of the picture is destroyed. "We want to identify all the images, and work to preserve earth pictures that are gradually being destroyed," Sakai said. Article: (The Epoch Times, May 24, 2005). 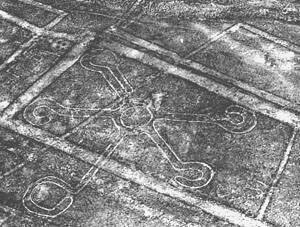 New designs found that predate the famous Nazca lines. 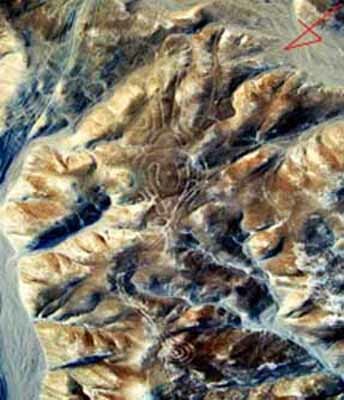 Mr. Johny Isla, director of the Andean Institute of Archaeological Studies, said the “geoglyph” figures appear to have been created by the Paracas communities between 500 and 400BC, whereas the Nazca culture developed after 50 BC. Mr. Isla and his partner Dr. Markus Reindel from the Dutch Institute of Archaeology discovered the Paracas figures using aerial photography and land-based surveys. The figures of humans, birds, monkeys and cats vary in size from 10m to 50m across, and are also grouped together in areas up to 60 m to 90 m across. Most of these geoglyphs belong to the Nazca culture but our recent studies demonstrated that there are at least 50 geoglyphs pertaining to the Paracas culture. These new figures are definitely different and older than those of the Nazca culture. One set of figures is known as the “Temple of Fertility” as one image represents a man, another a woman and the center image seems to represent a divine figure with a head from which emanates a series of rays that end in human heads. 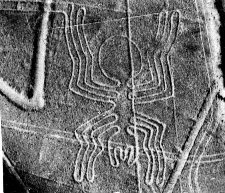 A five-year study by British archaeologists has shed new light on the enigmatic drawings created by the Nazca people between 100 BC and CE 700 in the Peruvian desert. They discovered an itinerary so complex they can justify calling it a labyrinth, and see it as serving ceremonial progressions. In the midst of the study area is a unique labyrinth originally discovered by Prof Ruggles when he spent a few days on the Nazca desert back in 1984. “When I set out along the labyrinth from its centre, I didn’t have the slightest idea of its true nature,” Prof Ruggles explained. “Only gradually did I realize that here was a figure set out on a huge scale and still traceable, that it was clearly intended for walking. Invisible in its entirety to the naked eye, the only way of knowing its existence is to walk its 2.7 miles (4.4 km) length through disorienting direction changes which ended, or began, inside a spiral formation. This ground shot is taken along the innermost pathway of the labyrinth directly towards the central mound. The line widens out towards its terminus, creating a false perspective that makes it appear parallel as it stretches away into the distance. 9). Rene Noorbergen. Secrets of the Lost Races. New English Library. 1977.